TS45 Star Wars Master Yoda T-Shirt is a Star Wars T-shirt released in 2007. This is a description taken from LEGO.com. Please do not modify it. Wear the power of the Force! He may be small, but Yoda packs some serious Force skills -- and smarts, too! 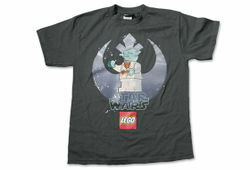 Show off your own wisdom with this LEGO Star Wars T-shirt, featuring Yoda the Jedi Master and the Rebel Alliance symbol. 100% Cotton! Facts about "TS45 Star Wars Master Yoda T-Shirt"